Are you receiving a lot of emails that you are reluctant to discard and your inbox is filling up? Increase the size of you TurboUSA email mailboxes by 10 times from the standard size of 100MB to the upgraded size of 1GB. 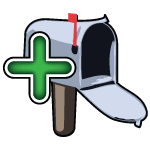 Email Upgrades are applied individually to email accounts accociated with your billing account. If you have more than one email account - please be specific which account you would like to apply the upgrade. Call 1-800-918-8726 to have our All-American support staff activate this feature on your email account. Email Upgrades are available for both our Accelerated plan and our Premium Bundle plan. Email Upgrades cost $1.00 per email account for our standard accelerated plan and are free for Premium Bundle plan (however it must be manually activated for each mailbox). Go to your Turbo USA inbox. Add Turbo Archive and Never lose an important Email.